As last year, the city of Amsterdam hosted Flame 2017, which took place from 8-11 May 2017. 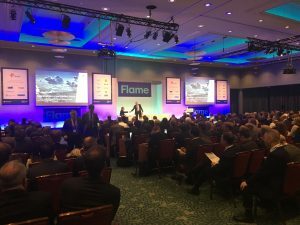 Flame is one of Europe’s leading natural gas and LNG conferences. It is the largest annual meeting of this organization. Normally this event has a good attendance, and also this year did not disappoint. It attracted a crowd of more than 650 people from the industry like gas producers and consumers, infrastructure providers, traders and regulators were present..
he agenda featured more than 100 panels and presentations over the course of these four days. Cyriel de Jong from KYOS presented his views on the value of storage, and also participated on the European Energy Trading panel that followed. The KYOS models KyStore and KySwing provided the basis for the presentation. The KyStore model supports traders and portfolio managers in natural gas markets. The gas storage optimization software raises revenues from gas storage trading operations, provides accurate valuations and reduces risk with adequate hedge recommendations. The model uses advanced stochastics including Least Squares Monte Carlo techniques to capture the full optionality in gas storage facilities..
KyStore is complemented by KySwing. The KySwing model helps to generate most income from gas contracts by optimizing the contract flexibility. Forward hedging reduces the risk on future income. The model applies advanced stochastics to find the optimal exercise. Swing options are typical components of gas contracts, which offer the opportunity to vary the contracted volume under a number of restrictions. They are also known as Take-or-Pay (ToP), interruptible and variable load contracts.